Citation Information: J Clin Invest. 2010;120(7):2307-2318. https://doi.org/10.1172/JCI41749. Cellular contractility and, thus, the ability to alter cell shape are prerequisites for a number of important biological processes such as cytokinesis, movement, differentiation, and substrate adherence. The contractile capacity of vascular smooth muscle cells (VSMCs) is pivotal for the regulation of vascular tone and thus blood pressure and flow. Here, we report that conditional ablation of the transcriptional regulator Junb results in impaired arterial contractility in vivo and in vitro. 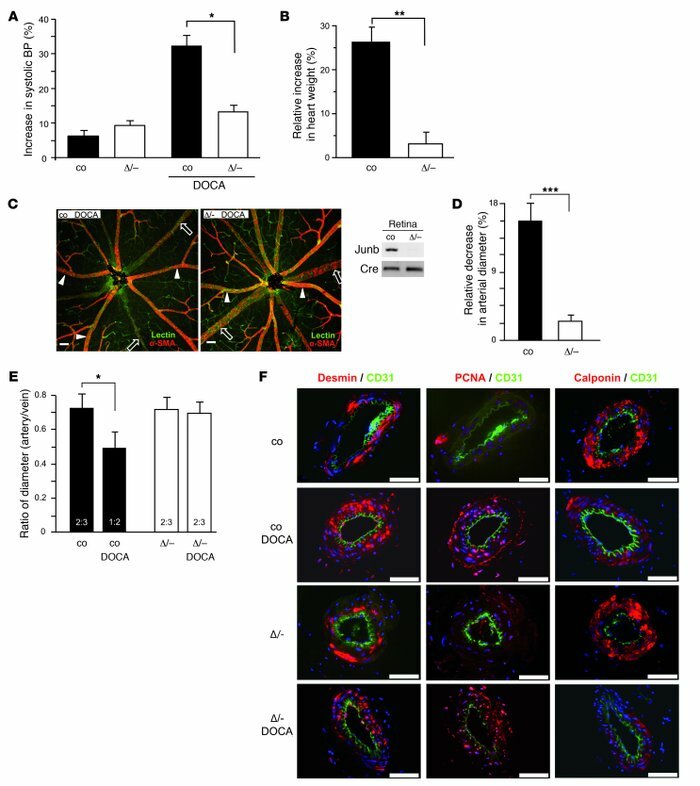 This was exemplified by resistance of Junb-deficient mice to DOCA-salt–induced volume-dependent hypertension as well as by a decreased contractile capacity of isolated arteries. Detailed analyses of Junb-deficient VSMCs, mouse embryonic fibroblasts, and endothelial cells revealed a general failure in stress fiber formation and impaired cellular motility. Concomitantly, we identified myosin regulatory light chain 9 (Myl9), which is critically involved in actomyosin contractility and stress fiber assembly, as a Junb target. Consistent with these findings, reexpression of either Junb or Myl9 in Junb-deficient cells restored stress fiber formation, cellular motility, and contractile capacity. Our data establish a molecular link between the activator protein–1 transcription factor subunit Junb and actomyosin-based cellular motility as well as cellular and vascular contractility by governing Myl9 transcription. Conditional Junb-deficient mice do not develop hypertension and adaptive responses in the DOCA-salt model. (A and B) Relative increase in systolic blood pressure (A) and in heart weight (B) is depicted for wild-type control (co) and Junb-deficient (Δ/–) mice subjected to sham operation or DOCA-salt treatment for 21 days. (C) Left: Whole-mount double-staining of retinal vessels with FITC-coupled lectin (green) and α-SMA antibody (red). Arrows indicate veins; arrowheads, strongly α-SMA–positive arteries. Right: Complete deletion of the Junb locus was verified by PCR with genomic DNA preparations from complete retinas of wild-type and Junb-deficient mice. Col1α2-iCre (Cre) PCR served as control for equal quality and loading. (D) Relative arteriolar narrowing determined by comparing diameters of arterioles from untreated and DOCA-salt–treated control and JunbΔ/– mice within a distance of 250 μm from the optical disc. (E) Ratio of artery to vein diameters is plotted for untreated and DOCA-salt–treated control and JunbΔ/– mice. (F) Immunofluorescence costaining of femoral arteries isolated from untreated or DOCA-salt–treated control and JunbΔ/– mice for CD31 and desmin, PCNA, or calponin. Scale bars in C and F: 50 μm. In each case, one representative staining of sections or of retinas of at least 3 different mice is shown. Data in A, B, D, and E represent mean ± SEM (n ≥ 6 for each condition). *P < 0.05, **P < 0.01, ***P = 0.005.